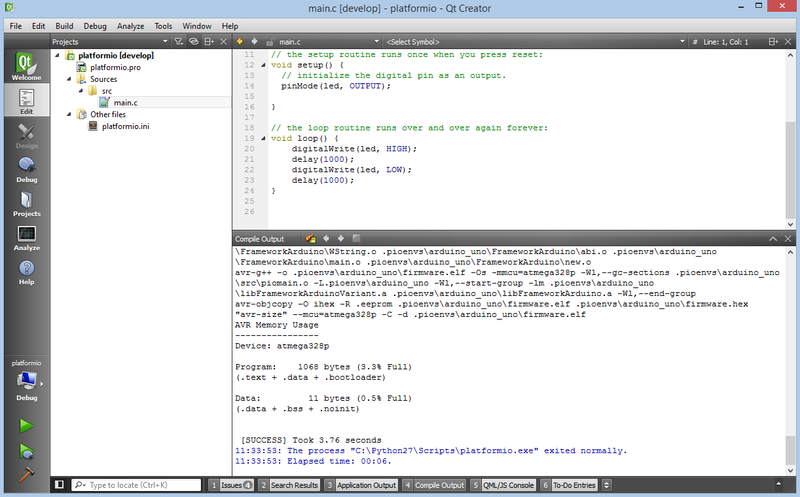 The Qt Creator is an open source cross-platform integrated development environment. The editor includes such features as syntax highlighting for various languages, project manager, integrated version control systems, rapid code navigation tools and code autocompletion. Refer to the Qt-creator Manual page for more detailed information. Build project: Menu: Build > Build All. First of all, let’s create new project from Qt Creator Start Page: New Project or using Menu: File > New File or Project, then select project with Empty Qt Project type (Other Project > Empty Qt Project), fill Name, Create in. On the next steps select any available kit and click Finish button. Copy the source code which is described below to file main.c. Locate the project configuration file named platformio.ini at the root of the project directory and open it. Edit the content to match the code described below. Taking everything into account, we can build project with shortcut Ctrl+Shift+B or using Menu: Build > Build All.